purchase a Cannon product. They also have a great customer service and warranties put in place to make buying from them less stress, unlike many other companies. Not to mention, they have some of the most competitive prices. Many of their safes come with features that you cannot find in other gun safes without spending big. Some of them have features such as a power supply & media outlet, longer locking bolts than the competitors, and anti-pry tabs. That is only a few of the features you can get when you choose a Cannon safe. They have earned a spot at the top of the industry. The Patriot Series fire safe will last in temperatures of up to 1200 degrees for thirty minutes. The lock is a commercial grade lock, unlike many other safes that have locks that can easily be drilled out. This safe is equipped with features that are usually only included on more expensive models such as a power outlet, media outlet, and Ethernet connection. 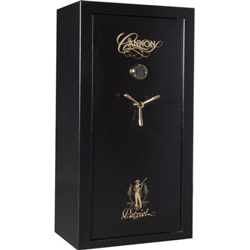 Unlike many other gun safes this safe comes with a lifetime warranty and Cannon, backs there warranties than most in the industry with excellent customer service. The power outlet inside is excellent in the event you want to add a light to your safe in the future. It will allow you to add this feature without having to cut holes in your safe to run a power cord to the outside. The built-in storage pockets on the inside of the door are great for small valuables you wish to store inside the safe. You can register your safe in the event something happens it will be fixed or replaced for life. Many safes do not feel stable when you open them. This safe has a solid feel when you open it and will make you feel better about locking your precious valuables inside. The shelves that are built-in are cheaply made. Some of the customers have stated that they have a tendency of breaking quickly. You can always install more sturdy shelves in the future, or you can take them out if you do not have any use for the shelves. You will probably have to modify the gun rack to make it shorter to hold smaller rifles. There is a gap at the top of the door safe. This could make you feel a little uncomfortable about the security of the safe. The Cannon Safe S19 Scout Series Fire Safe comes with many features that other Cannon Safes are equipped with such as a power outlet, media outlet, and Ethernet connection. It is also fireproof for up to thirty minutes in a fire up to 1200 degrees. The safe comes with a hassle-free lifetime warranty. The warranty is not like many other companies guarantees where you have to pay out of pocket for certain things. As long as you register your safe you don’t have to pay anything in the event some attempts to break-in your safe causing damage, someone succeeds in breaking into your safe causing damage, a flood damages your safe, or fire damages your safe. It covers parts, shipping, and the labor it takes to fix the safe if it can be repaired. They will replace the safe if it cannot be repaired. In case you are in search of a gun safe similar size but under 1000$, have a look at the list here! Unlike many other safes, the access code is easy to change. The keypad lights up making it better in the event you have to retrieve a gun in the dark. It comes with batteries so you can gain access to the safe even if the power goes out. This feature makes it a better choice when it comes to protecting yourself or your family. Like other Cannon Safes, the power outlet on the inside makes it easier to install a light inside the safe and will prevent you from having to cut holes in the safe. The divider is not fastened well making it slide. You can always put a few more braces on the divider to make it more sturdy. The gun rack will not hold short rifles or long guns such as an AR15 or 91/30. You cannot silence the keypad. This might make you uncomfortable if you have to retrieve your guns while an intruder is in your home. The sound is not loud enough for someone in another room to hear it. The Cannon Safe H8 Home Guard 75 Minute Fire Safe is one of the smaller safes that Cannon offers. The safe still has the features like the bigger Cannon safes even though it is smaller. One of the largest differences in this safe is that it is fireproof for up to 75 minutes, unlike many other Cannon Safes that are only fireproof for thirty minutes. Compare this Cannon H8 with safes from our list of the best fireproof gun safes. You will still get a power outlet, media outlet, and Ethernet connection inside the safe like you would on a larger safe. It also comes with the Cannon lifetime hassle-free warranty in the event the safe is damaged. This safe has built-in lights so you can use the power outlet for other things such as a dehumidifier. The safe is more solid than most of the competitors. You can bolt the safe to the floor so it cannot be moved. It is equipped with all the hookups inside the safe like the larger Cannon Safes. Several of the customers stated that the fabric that covers the interior is loose in spots. This is an easy fix with cheap glue. 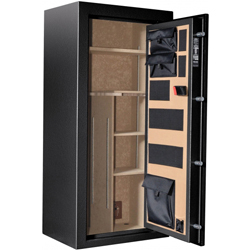 The price is a little higher than small safes from other companies, even those featured in our best gun safes as I’ve written about on this page. 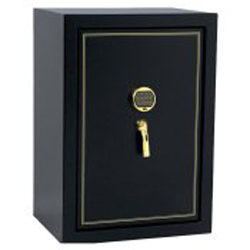 This safe comes with features that you cannot get in other safes. The safe does not come equipped with adjustable shelves. You have to purchase a larger safe if you want this option. The lock does not have a plate for extra protection. This could allow someone to drill out the lock and gain access to the safe. Most intruders will not take the time to drill out the lock on a safe. Here is an informative video by Cannon! As you can see, Cannon Gun Safes have some excellent features. They have things about them that aren’t so good, but some of the characteristics you like can’t be found on another gun safe. Also, you can probably tell that cannon gun safe reviews are some of the best reviews in the industry making them one of the highest rated companies and making their products some of the highest rated products on the market due to their excellent warranty. The list above has a gun safe that I am sure you will like. All the features on Cannon gun safes are pretty much the same, but they range in size. The prices are something that usually can’t be beaten when you look at the features and durability of a Cannon.